I’ve used this simple logging framework in some form or other on nearly every project I’ve worked on so it is already tried and tested. However, I think that if I am serious about other people or businesses adopting this I need to support it with a suite of tests that will give some measure of confidence that it does what it is supposed to. I also have some ideas for further improvements and these will definitely need to be properly unit tested. Finally, the fact this this is open source makes it very easy for me to publish all the code and associated tests withoutworrying about intellectual property rights of any of my customers. So having elected to use tSQLt as my testing framework lets’s get started. SetClrEnabled.sql – Enables CLR if not already enabled. 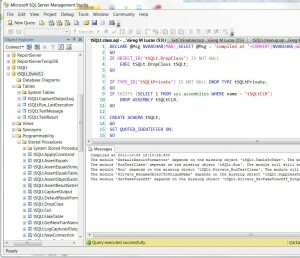 It also sets TRUSTWORTHY ON which allows CLR routines a much deeper level of acces to run on your SQL Server instance. This is unlikley to be something you would want to do in production but in a DEV environment it should be fine – and you shouldn’t be writing or running unit tests anywhere other than DEV anyway. The module 'DefaultResultFormatter' depends on the missing object 'tSQLt.TableToText'. The module will still be created; however, it cannot run successfully until the object exists. The module 'RunTestClass' depends on the missing object 'tSQLt.Run'. The module will still be created; however, it cannot run successfully until the object exists. The module 'Run' depends on the missing object 'tSQLt.Private_RunTestClass'. The module will still be created; however, it cannot run successfully until the object exists. The module 'Private_RenameObjectToUniqueName' depends on the missing object 'tSQLt.SuppressOutput'. The module will still be created; however, it cannot run successfully until the object exists. The module 'SetFakeViewOff' depends on the missing object 'tSQLt.Private_SetFakeViewOff_SingleView'. The module will still be created; however, it cannot run successfully until the object exists. That’s it, tSQL is installed and ready to go and you are now ready to write your first test – which I will cover in the next post in this series . I think that the only thing that is missing from the release package is a means of reverting to the pre-tSQLt state. 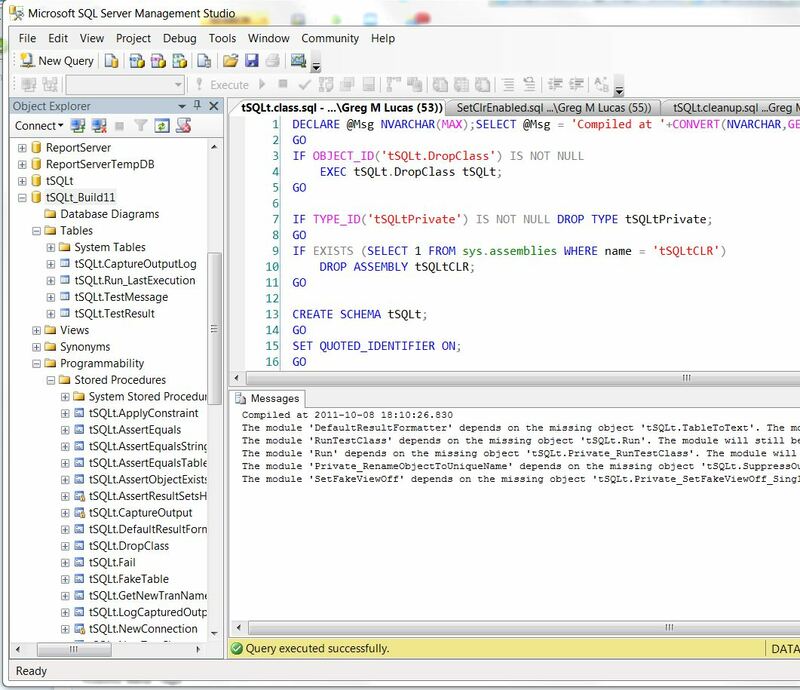 So I have provided this tSQLt Removal Script which will remove all traces of tSQLt from the selected database. The only thing this script won’t do is revert the CLR related changes since they may have already been enabled and you won’t thank me if this script turns everything off. UPDATE: The removal script will work with versions up to v.0.12. With effect from v1.0.4351.28410, tSQLt comes with a built in uninstaller sproc called [tSQLt].[Uninstall]. In the meantime, you can check out the Quick Start Guide or, for more detail the tSQt User Guide. In Part 2 we will begin writing our first tests.